So when I did my sound effects story (3.5) for Delia people were saying that they didn’t know what was happening. I tried to clean things up in this one- spend less time on the soundscape and just put sound effects together for a clearer story. Here, a woman wakes up, yawns, showers, drives, enters a shop, buys something, goes home, and feeds her cat. Very simple. Hopefully this one is clearer. I used much less technique in this attempt as well. 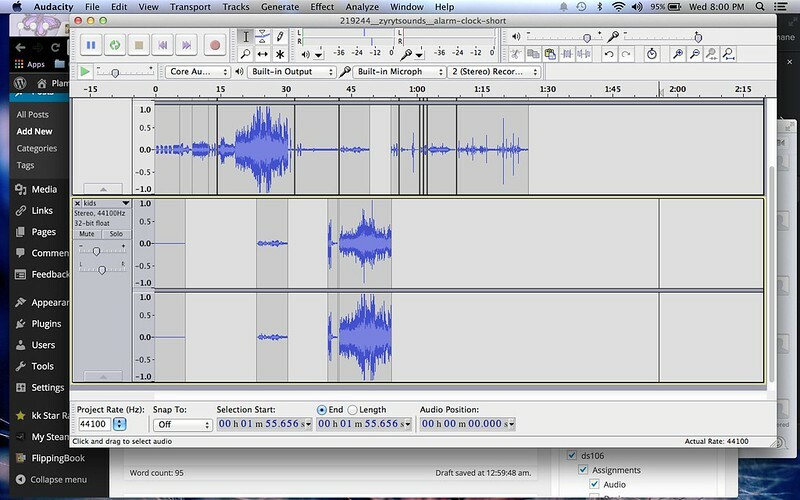 I downloaded my sound effects, and all of the editing I did was cutting. That was literally it- just drag and drop. Maybe this is what we were supposed to do in the first place? This is a very clear audio post to me. Everything is going in a nice chronological order. I like how you had the wind along with the children playing in the background, which I don’t think was mentioned in the post. This made me wonder if she was picking up her child from work or if that was intentional. I also liked how she had a reaction to the cat and how we hear it eating since I know animals have a tendency to chew quite loudly :p. I would go back into this post and specify why you had the playground inserted into this post. May have been a typo. Good job though! It was very straight-forward and easy to understand. Thanks- I just wanted to add a dimension of reality to the drive. Not everything is quiet, you know? Like she was driving by a park after school let out. I liked how simple your story was- I think this is something a lot of people can relate to! It was super clear what was happening.